I have two DSM rasters, one is 10km radius photogrammetric data, the other is 2km radius LiDAR data, both centred around the same point. I need to combine these together, essentially inserting the 2km LiDAR raster into the other and removing that portion of the photogrammetric data, the idea being that the LiDAR is much more detailed in the area closest to the centre and the site that I'm working on. I've resampled the photogrammetric raster to match the LiDAR so the cell sizes are the same. Add the grayscale hillshade and multispectral RGB layer tint rasters to ArcMap, if they have not already been added. 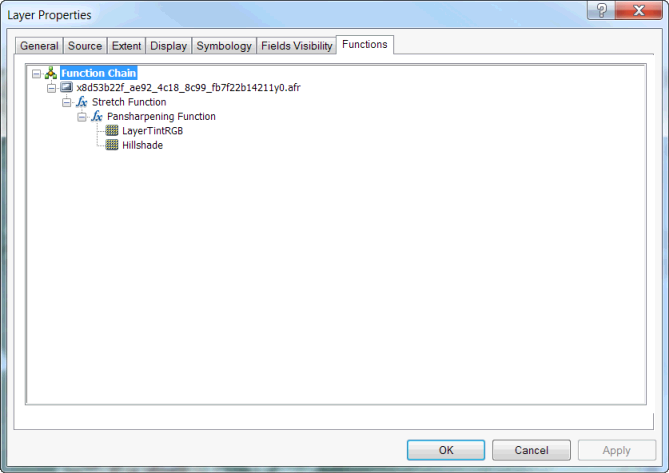 Open the Image Analysis window by clicking Windows on the top bar menu, then clicking Image Analysis. In the top section of the Image Analysis window, select both the hillshade and RGB rasters using the Control key and clicking on each raster’s name to highlight it (figure 5). Click the Pan-Sharpening tool in the Processing section of the Image Analysis window. This will create a new layer, which will be listed as the top layer in the Image Analysis window. In the Image Analysis window, right-click the newly generated pan-sharpening layer and click Properties. On the Functions tab, right-click the Pansharpening Function and click Properties. On the General tab of the Raster Function Properties dialog box, change the Output Pixel Type to 8 Bit Unsigned. On the Pan Sharpen tab, change the Method to Simple Mean. Keep the rest of the defaults and click OK.
Right-click Pansharpening Function, click Insert, and click Stretch Function. Change the Type to Minimum-Maximum. Check the Use Gamma option. In the Gamma section of the dialog box, change the Gamma value from 1.0 to 0.5 for each of the three bands. In the Statistics section of the dialog box, type 5 as the Min and 215 as the Max value for each of the three bands. The final function chain will look like figure 6. Click OK to check your results. Not the answer you're looking for? Browse other questions tagged arcmap arcgis-10.3 raster-calculator combine or ask your own question. Combining multiple overlapping rasters - retain maximum value? Combining non-overlapping binary rasters with ArcGIS Raster Calculator? Combining two rasters into heatmap using QGIS? Creating prediction map by combining several rasters and vectors in ArcGIS Desktop?